There was a time, not too long ago, back when I was first entering the world of Celiac Disease and the gluten-free lifestyle, that I discovered there was a huge lack of things like…sandwich wraps…at least decent ones…out on the gluten-free market. That has since changed, thank goodness, as more familiar products are being created. It’s nice to actually have a gluten-free product that isn’t chips or cookies or brownies or cake or…you get my point. When it comes to food, I like my snacks too, but I really crave real food. And, as I’ve been making a point of cleaning up my diet, real food is taking a top priority over highly processed, nutritionally-lacking foods. I mean, I still have my (gluten-free) cake and eat it too…but I’m making better, plant-based, real-food choices more than anything else. I am working off a meal plan and it’s really a life savor. Sometimes it does mean a ton of prep work…but it’s worth it. In the end…it is totally worth it. Well, tonight’s meal plan called for Greek Tacos. The original recipe called for pita bread, but the one version of gluten-free pita bread I found isn’t be sold at my grocery store anymore…so…tortillas it is. When I went shopping at Jungle Jim’s International Market on my birthday, one of the gluten-free products I picked up that I hadn’t found anywhere else was…sandwich wraps. It is so difficult to find good gluten-free wraps, even today. You go to fold one and it breaks. It’s too thick…or perhaps not thick enough. It doesn’t have a good flavor. It doesn’t cook well. It doesn’t hold together or immediately crumbles when you wrap them up. They rip and tear…you get the drift. Well, as I had never heard of the Toufayan Bakeries brand before…I decided it was worth trying. If anything else, I was just stuck with another wrap that crumbled under my high expectations. Well, with these Greek Tacos being prepped and needing a vehicle in which to be built upon, I pulled the Toufayan Bakeries Gluten Free Garden Vegetable Wraps out of my pantry and immediately set to work on building dinner on them. Toufayan Bakeries is one of the largest, privately-held, specialty bakeries in the United States. It produces over 100 varieties of baked goods daily, including its own line of gluten-free wraps and gluten-free pita chips. I have yet to find the gluten-free pita chips, but I found a few varieties of the wraps while grocery shopping. Being on a budget even on my birthday, however, I only picked one to try in the end. Available in four different flavors— original, garden vegetable, savory tomato, and spinach— the wraps are 100% gluten free. These wraps are processed a separate, dedicated gluten-free line, routinely tested to be under 10 ppm. It was definitely time to put this new (to me) brand to the test. And what does that better than a mess of Greek vegetables, lentils, and sauce, right? I went to work immediately building the Greek Tacos up with warm lentils, thinly sliced red onion, tomatos, local bibb lettuce, and diced cucumber…topped off with a vegan tzatziki sauce. Talk about testing the durability of a wrap, right? Well, the only problem was…there was too much veggie goodness for the wrap, so actually folding it up wasn’t happening. I had to eat it…like a taco. And since this is Greek Tacos…that actually was okay. I’m thinking quesadillas or burritos might be next. Maybe just a basic sandwich wrap. We’ll see. With wraps that don’t fall apart instantly…the possibilities are endless. 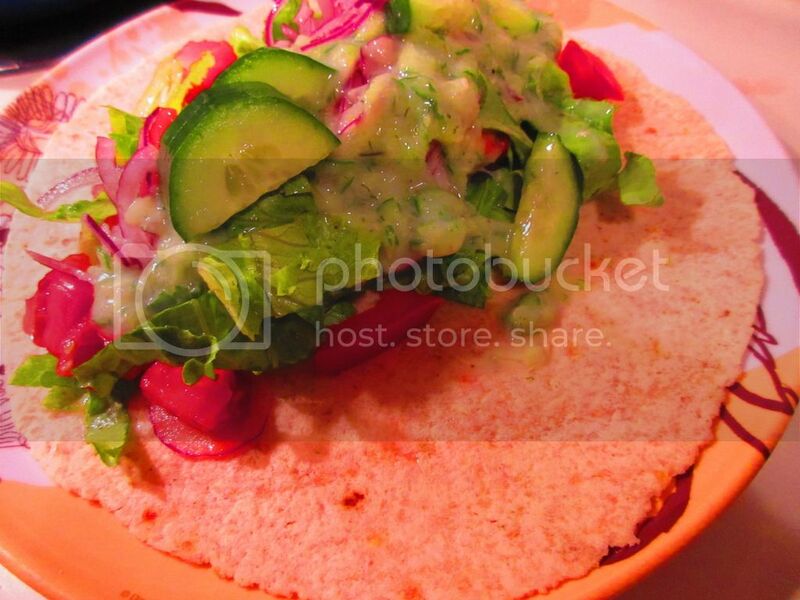 So, what are the Toufayan Bakeries Gluten Free Garden Vegetable Wraps made from? Well, they are made with tapioca starch, water, rice flour, soybean flour, shortening (canola oil, palm and palm kernel), vegetable blend (spinach, parsley, red bell pepper, carrot, tomato, onion, shallot, garlic) food starch modified (corn starch, tapioca starch), potato starch, contains 2% or less of the following: yeast, baking powder (calcium acid pyprohosphate, sodium bicarbonate, corn starch, monocalcium phosphate, calcium sulfate, whole eggs, fumaric acid, mono and diglycerides with citric acid (a preservative), maltodextrin, dextrose, xanthan gum, egg whites, calcium propionate (to maintain freshness), and salt. Whew. That’s a laundry list, yeah? I actually would prefer for my wraps to have fewer ingredients and additives in them, but I guess that’s what gets them so close to that flour tortilla flavor. As for nutritional information, a serving size of the Toufayan Bakeries Gluten Free Garden Vegetable Wraps is 1 wrap (52 grams) and there are 6 wraps per package. This serving will provide you with 120 calories, 3.5 grams fat, 0.5 grams saturated fat, 0 grams trans fat, 20 mg cholesterol, 350 mg sodium, 24 grams carbohydrates, 2 grams fiber, 4 grams sugars, and 5 grams protein. They do have the fact that they are high in fiber and protein to make them feel more filling in the end. So, that is very handy. 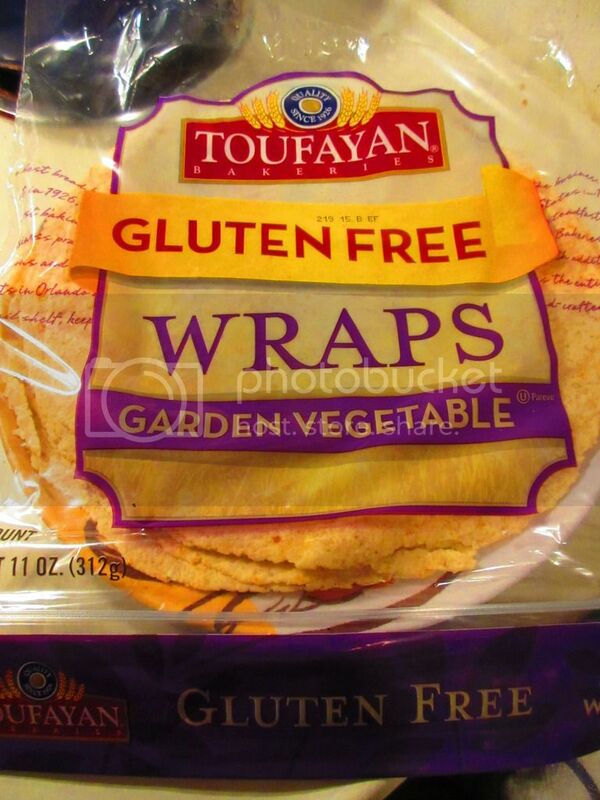 I absolutely loved what I tasted when I bit into the Toufayan Bakeries Gluten Free Garden Vegetable Wraps. And while my first attempt at using them wasn’t exactly as I envisioned, I have high hopes for the next. If you can track down the Toufayan Bakeries Gluten Free Wraps…I highly recommend it. One of the best attempts at a wrap I have ever had. Nicely done! This entry was posted in Bread, Entree, Food, Gluten-Free, Mediterranean, Products, Review, Sandwich, Tortillas, Vegetables, Vegetarian, Wraps, Yogurt by The Celiathlete. Bookmark the permalink.